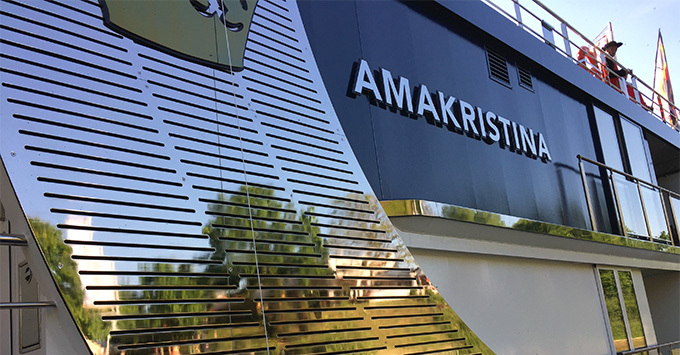 (2:13 p.m. EDT) -- Following three days of clouds and rain, the sun shone just in time for the christening of AmaKristina, the newest river ship from AmaWaterways. "I name this ship AmaKristina. May God bless and protect her, her crew and all those who sail on her, forevermore," said godmother Kristin Karst before successfully smashing a bottle of Champagne against the ship's hull at the event in Lahnstein, Germany, on Wednesday. Karst, for whom the ship is named, is also part owner and executive vice president of AmaWaterways, which is celebrating its 15th anniversary this year. The event kicked off as the vessel neared Lahnstein, with the city's fire department boat spraying jets of water into the air and sounding its horn. AmaKristina answered as an onboard band played and applauding locals crowded the docking area to catch a glimpse of the ship's arrival. 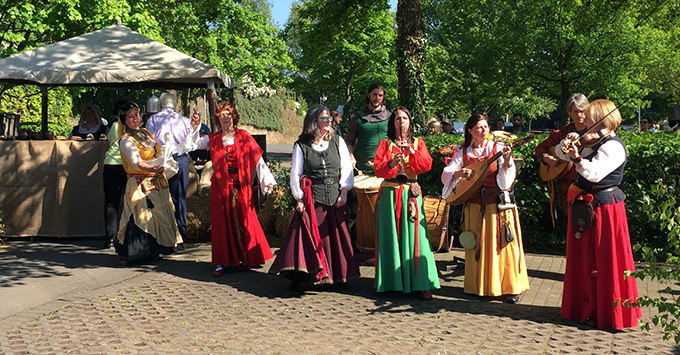 As passengers disembarked on a gangplank adorned with trees and flowers, they were met with a small festival setup, featuring tents with German beer, pretzels and sausages, as well as costumed singers, dancers and a magician. Following the gathering, with Stolzenfels castle as a backdrop, students from the local elementary school sang songs, AmaWaterways owner and President Rudi Schreiner spoke, Father Armin Sturm of the Church of St. Martin offered a blessing, and Lahnstein Mayor Peter Labonte welcomed the crowd and wished the boat "good winds and 6 inches of water below the keel." Labonte asked Karst, Scheiner and AmaKristina Captain Jan Brown to sign the town's golden book -- a tradition in Germany -- to mark the event. Each was then presented with a gift, and flags were exchanged between the vessel and the town. Past godmothers from several other Ama ships were also recognized. "We could not have accomplished this all without the love and support of our family, our friends, our crew, our business partners and, of course, the thousands of vacationers who travel with us year after year," Karst said. "May all who sail this new vessel find joy and enrichment onboard and within the destinations they visit."